In Italy big videogame websites talk about you very often (example http://www.everyeye.it/articoli/speciale-oculus-rift-room-scale-tracking-nostra-prova-35001.html), but people can't find your Rift on Amazon.it (over there it's only sold by third party sellers with crazy prices). Another problem is that you didn't translated in italian yet on your oculus home. Basically Oculus Rift seems completely exotic in my country. I hope you will fix this situation soon, people wish to try your Rift but it's basically an import device. If you need someone who can translate the menu I can make this job for you, so let me know in PM (just in case) please. However, I agree that the app could support more languages. Thanks for your feedback. cybereality thx for reply, unfortunately even the oculus website is in english. yes we can order it from www.oculus.com but it's again very exotic to do. the perception is that we are buying something hosted outside from our italian borders, and it's true. The customer care is in english too I guess. I mean it's a serious problem trust me, I really wish to encourage you to let amazon.it to sell your bundles, if you had done it before during the summer's sale you could have sold a lot more. The same problem is happening with the vive. Italy is an uncharted territory for Oculus and Vive. In my opinion maybe if you don't come in my country Microsoft Mixed Reality will be the only name ever remembered in the popular mass tech culture of my country if they will relase their HMDs in phisical shops and amazon. I'm speeching about mass market, not about few geeks over internet that know everything about tech shades. I wish just to encourage you to aiming the right target if you belive that Oculus CV1 has more to say. 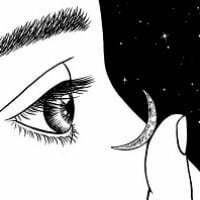 That website that I show you as an example at the first post have an enourmus quantity of people who read it every day, and there are many others, all of this people wish just one thing: try it. But maybe the exotic~(out of italian borders)~"foreign language"~very far customers care with english speech~no physical demo to try~"thing" makes people ultra scary and run away. Our website is in many languages. You can change languages at the bottom of the page. We also have support in many languages, but I don't recall off the top of my head if we have Italian agents. thx I didn't notice the exsitence of this button, it's super hide. it's at the very bottom of the page. I stongly suggest you to put it on the top left space of the website because of the affordance. for example Lone Echo is your best game but there is no italian language. how can many people think to buy it? But that is still up to the devs to do - Oculus doesn't fully control what a game has in it nor does even bigger retailers such as Steam. Granted the other two things are in Oculus control could be fix over time, software is still up to the devs to add in stuff like that if they wish to. As far as Amazon.it .. that would be up to Amazon really. 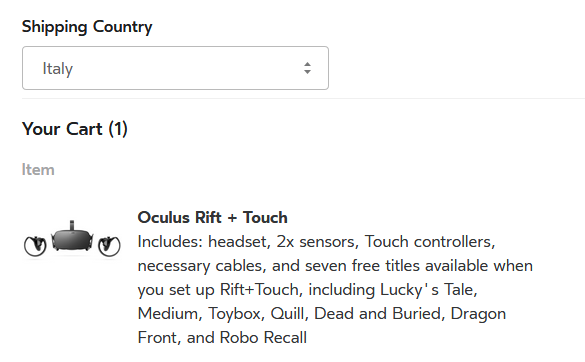 Oculus does business with Amazon itself, but as far as where it is solid is still a bit up to Amazon if they wish to sell it in that country or not. Isn't Lone Echo an Oculus exclusive? If so Oculus should pay for localisations, I will explain it in shorts: in Italy a lot of people doesn't understand english, on the websites, forum etc...etc... people is starting to ask about oculus rift, where to buy it, price, killer applications. Well, it's all ok but in that exact moment where someone write the words asking <<there is no italian localisation? )>> a lot of people just close the topic, and go somewhere else. Its normal. So all the effort that Oculus made to be famous die in that exact moment in my country. Selling a product exclusively just means you are the only store selling it. The manufacturer of the product is responsible for how the product is manufactured, serviced, warrantied, etc. If you have a problem with Lone Echo's localisations you need to contact the developers about it. Exclusive does not mean it's controlled by the company though. It just means there was a small deal made with the dev to make the game for Oculus first. This could include resources to build the game while the idea of how the game works, function, and etc is still up to the dev to make happen. It wasn't really MADE by Oculus - it was just supported with money to make it happen. I hope they can work something out though and we can see the Rift world wide. As far as where and etc etc the main site would be the place to go to and they do support multi languages there if you want to buy it from their site. But again, the games are a different subject. Devs would have to support it to make up subtext and or voice actors and that cost time and money at the end of the day. Think of Oculus as just any normal software retail store really, but the cool thing is just that they make the VR helmet to support what you buy. At this point - as the community keep growing, it is just going to come down to time and that means we should see more support for more things over time.